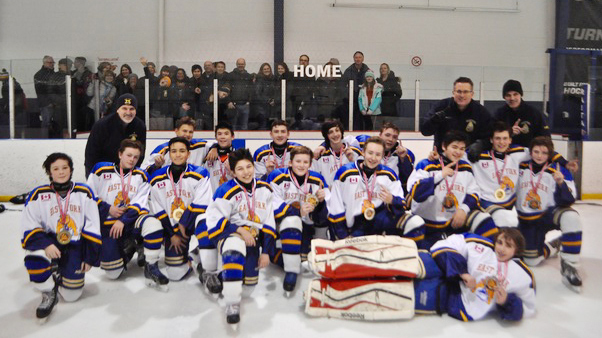 The East York Bulldogs Bantam Selects hockey team recently undertook a fundraising campaign for the Beach Out of the Cold program. Photo by Jason Kennedy. This past January, like lots of other people, the families of the East York Bulldogs Bantam Selects hockey team applied themselves to “Marie Kondo-ing” their overflowing closets. However they added one twist. Working together and applying a little social media magic, this local hockey community hoped their closet purging – think outgrown sports gear and toys, unused holiday gifts and more – might generate solid cash for a local charity. So, in February, the 2018/19 Bantam Bulldogs kicked off their first-ever Facebook online auction for the Beach Out of the Cold program. While they modestly aimed to raise a few hundred dollars, thanks to the power of teamwork (and Facebook! ), the team watched their decluttering game rise to whole new level. Ultimately, their fundraiser earned a full $1,000 for the local charity. How did they do it? And why this fundraiser in the first place? On top of all the things he’s already hoping to instill in his young players – from puck handling and resilience to good sportsmanship – the Bulldogs’ head coach Doug Skeffington said he’s been wanting to encourage a habit of giving back amongst the team’s teenage players. “We picked our local Toronto Out of the Cold program in the Beach because our team families have many ties to this program,” Skeffington said. He added that some players and team parents already volunteer for OOTC and that some families been involved with OOTC for decades. Things got off the ground quickly thanks to strong support from the East York Hockey Association, the Bantam team admin (Skeffington, assistant coach Chris DeKluyver, team trainer Paul Smith and manager Steve Crane), plus team parent Connie Crane who coordinated the auction. But the fundraiser really owes its success to the broad support of team families and the Beaches/East York community, said Crane. The Bulldogs found that sports gear was a particular hit – especially items like Jays ball caps and a vintage Roy Halladay bobblehead. And a few creative auction contributions really helped too. Team parent Michael Shin, for example, a Paddle Canada-certified stand up paddle board instructor, donated a private SUP lesson around the Toronto Islands which generated brisk bidding (with the prize in the end going to team parent Elaine Gauthier). The auction closed on Feb. 22, and recently the Bulldogs delivered auction proceeds to Beach OOTC co-chair Paul Dowling. In thanking the East York Bulldogs organization, Dowling underlined the charity’s huge reliance on local fundraising.